A resource for agencies working with survivors of Domestic Violence, Sexual Assault or Dating Violence. 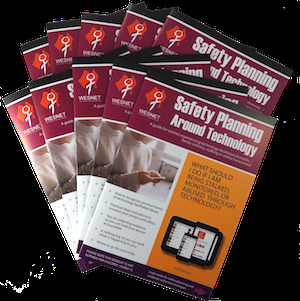 Now in it’s second edition, it covers how women can protect themselves against unwanted monitoring and other types of online abuse. It also includes a stalking log for women to use to collect evidence. Recording information may help document behaviours for violence prevention orders or criminal prosecution. Please note this document is not available electronically. Shipping:$16 Flat Rate Shipping Australia Wide, applied at checkout. WESNET Member:Phone us on 1800WESNET for your discount code.